1.1 This website (the “Site”) is operated by Bozing.com, Tullamore, County Offaly, Ireland. In this Privacy Statement, references to “we” or “us” means, Bozing.com. 1.4 The Privacy Statement applies to the operations of this Site. 1.5 Bozing.com and their associated business’s are fully committed to protecting and respecting your privacy. 1.6 It is the intention of this Privacy Statement to explain to you the information practices of Bozing.com in relation to the information we collect about you and other users. 2.1 For the purposes of the Data Protection Legislation, the Data Controller of the Site is Donal Dold, Tullamore, County Offaly Ireland. If you contact us directly, or we contact you, we may receive additional information about you such as your name, email address, phone number, the contents of the message and/or attachments you may send us, and any other information you may choose to provide. We record the date of the call and the Reason for the contact. Any query you may have had and a record of the conversation between yourself and a representative of our business. We will keep a record of any follow up business dealings or conversations. 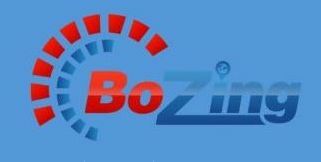 Bozing.com, will keep your personally identifiable information private and will NOT share it with any unauthorized third parties. We also anonymously collect information about your visit, including the Uniform Resource Locators (URLs) of the pages you visit during your visit, articles you view, length of time on page and referring URL. This is the web page that you came from if you followed a link to our site. If you leave a comment. This helps us better understand what content appeals to our users and how to best structure our site. • Details of the newsletter emails we send to you that you open, including any links in them that you click on. 8.1.19 notify you about changes to our Site, services or policies. 9.1 We consider your Data to be private and confidential. Your Personal data may be shared within business’s associated with Bozing.com, for any of the purposes set out in this Privacy Statement. 11.1 If our site contains links to and from other websites and web platforms. In addition, third parties websites may also provide links to the Site. If you follow a link to any of those websites or web platforms, please note that those websites and web platforms have their own privacy policies and that we do not accept any responsibility or liability for those policies. Please check those policies before you submit any personal data to those websites. 12.1 We endeavour to use appropriate technical security measures to protect your personal data which is transmitted, stored or otherwise processed by us, from accidental or unlawful destruction, loss, alteration, unauthorised disclosure of, or access. Our service providers are also selected carefully and required to use appropriate protective measures. 13.3 Subject to certain conditions, you are entitled to have access to your personal data which we hold (this is more commonly known as submitting a “data subject access request”). 13.4 Subject to certain conditions, you are entitled to receive the data which you have provided to us and which is processed by us by automated means, in a commonly-used machine readable format. 13.5 You may challenge the accuracy or completeness of personal data which we process about you. If it is found that personal data is inaccurate, you are entitled to have the inaccurate data removed, corrected or completed, as appropriate. 13.6 Subject to certain conditions, you have the right to object to or ask us to restrict the processing of your personal data. 13.7 Subject to certain conditions, you are entitled, on certain grounds, to have your personal data erased (also known as the “right to be forgotten”), e.g. where you think that the information we are processing is inaccurate, or the processing is unlawful. 13.8 You have the right to withdraw your consent to any processing for which you have previously given that consent. How do I execute these right? Requests for such information should be made in writing by email to dataprotection@bozing.com. If possible, you should specify the type of information you would like to see to ensure that our disclosure is meeting your expectations. We must be able to verify your identity. Your request may not affect the rights and freedoms of others, e.g. privacy and confidentiality rights of other individuals and/or businesses.